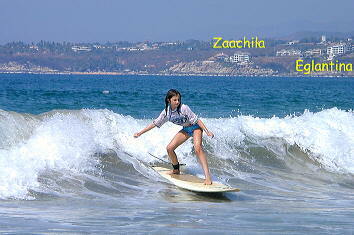 Zicatela beach in Puerto Escondido is known as one of the top surfing beaches in the world. Home of the "Mexican Pipeline", there are at least two international surfing competitions there each year, usually in September and November. 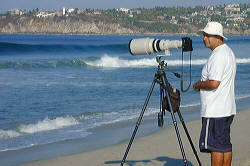 If you are interested in surfing or watching some of the top surfers in the world, Puerto Escondido is the place to be! At Central Surf you can buy(or rent) surf boards and boogie boards, beachwear, arrange surfing lessons, or purchase surfing pictures. Although much of the time the surf at Zicatela makes it unsafe for all but the most experienced surfers, La Punta, at the southeast end of Zicatela, is often ideal for beginners. Our 10 year old daughter learned to surf there. Ruben Pina's photographs have been published in many of the world's top surfing magazines. He sells his photos at Central Surf. The January/February 2000 issue of Longboard Magazine has an excellent article and photographs on the Puerto Escondido Central Surf Longboard Invitational held September 20-26, l999. The 3rd annual Central Surf Longboard Invitational is scheduled for March 19-24, 2002. The tube riding contest will be held at the most famous beachbreak in the world, Puerto Escondido's "Mexican Pipeline". For more information, see Central Surf's website. You can learn more about Central Surf and the Salinas family at their web site.